They called him”Hal” and “Skinny” but his real name was Hector. He was 6’2″ and weighed about 180 pounds. Just before he retired, the great Ted Williams told reporters that Brown had never thrown him a “fat pitch” and called Skinny a “great pitcher.” Who could be more qualified than the “Splendid Splinter” to make a judgment like that? It was Brown who was on the mound the only time the Red Sox ever pinch hit for “Teddy Baseball” during a 1960 game against the Orioles, although the move had nothing to do with Williams’ inability to hit old Hector. Instead it was because “The Kid” had fouled off one of Skinny’s fluttering knuckle balls right into his own right foot and couldn’t continue the at bat. 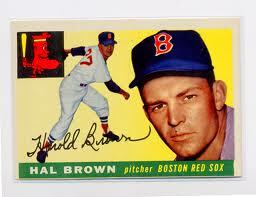 Brown threw right-handed, had a terrific slider and later in his career he learned how to throw that knuckleball. Those two pitches helped him stay in the big leagues for 14 seasons, coming up with the White Sox, in 1951. He was traded to the Red Sox in 1953 in the deal that sent the quickly-fading Boston shortstop, Vern Stephens to the Windy City. Brown surprised all of baseball by going 11-6 during his debut season in Boston, when Manager Lou Boudreau gave him his first shot as a regular big league starting pitcher. Boudreau then put Brown back in the Boston bullpen the following year. Hector’s record fell to 1-8 as he floundered along with the rest of that 1954 team, which finished the season with just 69 wins. In May of 1955, the Red Sox gave up on Brown and sold him to the Oakland Seals of the Pacific Coast League. It wasn’t until after he landed in Baltimore that Skinny really hit his pitching stride. In eight years with the Orioles, Brown started and relieved his way to a 62-48 record. The Yankees purchased him from Baltimore in the last month of the 1962 season and he got his first and only start in pinstripes against the Red Sox, two days later. Boston battered him pretty good and he left in the fifth inning, trailing 9-2. He got just one more relief appearance that season and then was sold to the Houston Colt 45s the following April. His last big league season was 1964. He retired with a 14-season career record of 85 wins and 92 losses along with 11 saves, 13 shutouts and a 3.81 ERA. The Greensboro, NC native was born on this date in 1924.